You need to keep your space full for as many hours of the week as possible. That’s one of the pillars of running a profitable sports facility. And for many boutique-type sports academies, it’s easy enough to do during after-school hours and weekend days. What’s left is to fill in the gaps — such as weekend nights. We’ve already highlighted a few ways that eSoft Planner clients tackle this, such as a family fun night and an open-gym style event for kids. If you’re like most sports academies, the parents in your target market probably need a babysitter if they want any time alone with their partners. However, hiring a babysitter isn’t always simple, as many of you know firsthand. Even if you already have a babysitter you trust, there’s always the question of their availability, and there’s always a chance of last-minute cancellation. Plus, these days parents are often expected to pay $10/hour or more for a babysitter in their home, which can make them hesitate before scheduling a date. Your sports facility is in the perfect position to rescue these weary parents. Most of the ballpark figures I’ve seen for a Parents’ Night Out are $20 or so per family for 4-ish hours. That makes them a lucrative option for you to use during a slow period, but an affordable option for parents. They’re even more affordable for parents considering what’s included, which is typically a pizza dinner (meaning parents don’t have to cook it or clean it up) and full use of your facility and professional staff, which would cost significantly more otherwise. In addition, a Parent’s Night Out may attract new potential clients. It also gives you a chance to show them your programs. 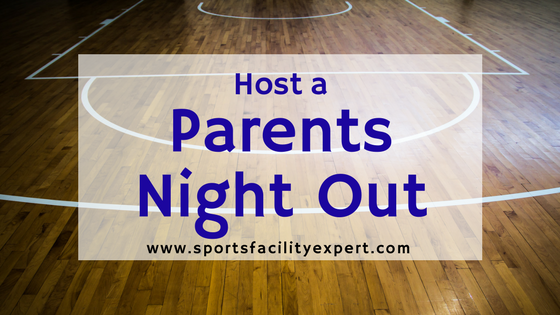 If you’re in the majority of sports facilities that already host birthday parties, planning your Parent’s Night Out should be fairly simple. If your birthday party packages have several theme or game options, you might simply include two of them to fill the extra time. Another 90-minute game, OR a kids’ movie if you you want the kids calmer as the night goes on. Once you’ve chosen a date (or dates — a regular event is even better for letting parents plan), scheduled the staff and figured out a basic itinerary, you can get started on marketing. Use your typical event promotion schedule (mine is detailed here) to get the word out. However, don’t forget to use the event itself to promote your other services. Make sure your staff is primed and ready to help parents sign their kids up for future services at your facility. You can give parents an extra incentive by offering to apply the cost of the Parents’ Night Out toward any other services they sign up for that night. Good luck planning your event, and please leave a comment with any other ideas. Also, if you’re ready to start using a software that can handle the enrollment and scheduling for events like this, check out eSoft Planner, my company built it just for sports facilities.